Again, back to my Jakarta trip.. it was my third visit to Jakarta, and I’ve discovered another side of this city. On my last couple of visits, I’ve seen poor people on the street, dirty toilets, huge traffic jam etc, and I never thought I’d be able to live here. However, during this trip a friend of my husband took us to a complex of shopping buildings in Jakarta CBD and I had a totally new experience there! My husband said this place is too fancy (because of many brand shops and expensive stores) but it reminded me of Japan! There are three or four of shopping building next to each other, and each building got many shops and restaurants inside, including some Japanese shops such as MUJI. The thing which excited me the most was Japanese food there. When the friend asked us what we wanted to eat, I told him “no Japanese please” because I thought the Japanese food there wouldn’t be so nice. But, as I explore each floor I found so many nice Japanese restaurants. In the end, we decided to go to this wafu (Japanese style) pasta restaurant for dinner. 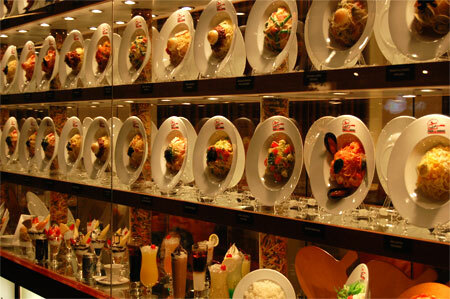 We eat many unique flavor pasta in Japan, and this restaurant had those. I was happy to have dinner here because pasta is one of my favorite food and I knew I wouldn’t be able to eat this type of food back in Perth. Chicken Teriyaki, Squid Ink, Chicken Katsu with Egg Sauce etc… if I was very hungry I’d wanted to try either sukiyaki pasta or seafood curry soup pasta, but I decided to have scallop & mushroom soup pasta. 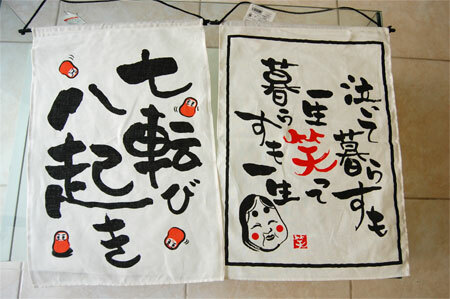 Eel & Unagi (Una-Tama) sounded interesting too. There are also pizzas, teishoku menu as well as entrees such as edamame (branched and salted green bean in pods) and hiya-yakko (chilled tofu). Friend had squid, prawn and cod roe pasta, and my husband had creamy crab carbonara. It was delicious. Sigh, I wish I could go there everyday to eat these Japanese food like those Japanese business men I saw at the Izakaya..
We had bakmi (noodle soup) many times during this stay. 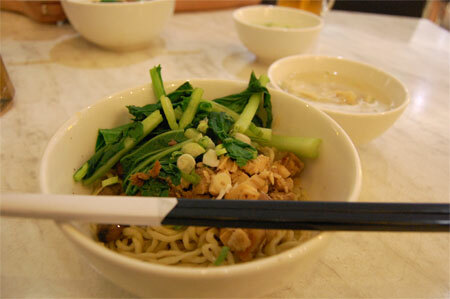 Bakmi is not really a special food, and people eat it quite often over there. (it’s like “ramen” in Japan) The photo is Bakmi Ayam (chicken noodle soup) at Grand Kelinci. 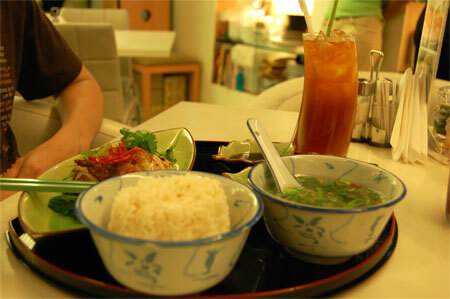 My brother-in-low took us to Plaza Senayan (a mall in CBD area) and we had lunch at a Singapore restaurant there. 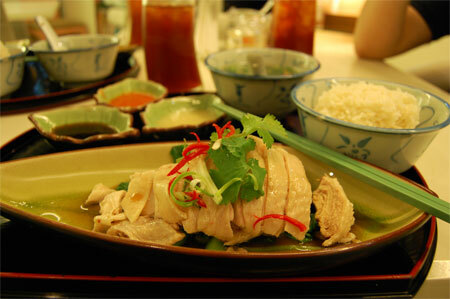 I had Hainan Chicken Rice, and brother-in-low had roasted chicken rice. 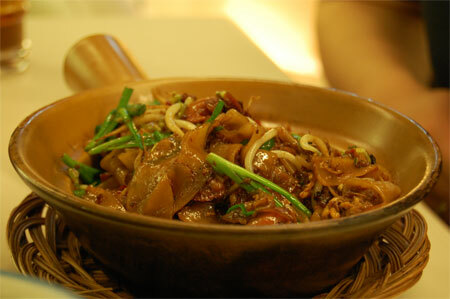 At the Singapore restaurant my husband had stir-fried kwe tiau. I had this satay ikan Bali (Bali style fish satay dish) at a food court “Food Connection” in Kelapa Gading Mall. The fish was spicy, and nicely crusted. Very nice! 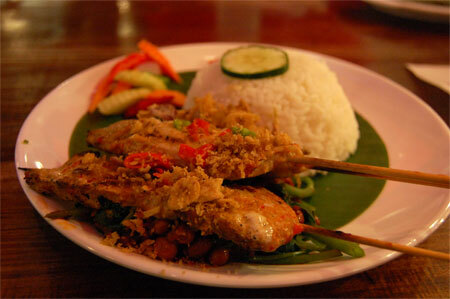 Satay is one of my favorite Indonesian side dish! 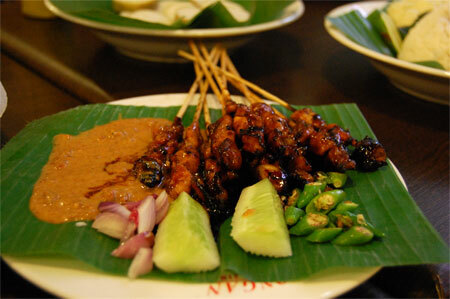 Satay actually can be a main meal when you order it with nasi (steamed rice) or lontong (sticky rice cubes). My husband likes satay kambing (lamb satay) but I prefer satay ayam (chicken satay). This time, again, our trip to Jakarta ended up to be a shopping-trip … There are many shopping malls in Jakarta, and we did shopping everyday except for the day of our wedding party. The weather was good throughout our stay, so it was good. After one hour of shopping at Daiso, we took a cab to parents’ apartment room to take a shower. The apartment is actually just few hundred meters away from Artha Gading, but we wouldn’t be able to walk there.. it’s Jakarta. There is another huge shopping mall called “MOI (Mall of Indonesia)” right in front of the apartment. This mall is pretty new, it was still under construction last time we were in Jakarta. MOI is an entertainment mall for family, so it’s got many kids attractions, rides, and game centres inside as well as individual shops , cafes and restaurants. After refreshing in the apartment, we went to Es Teller 77 in MOI to grab a bite. We had shoumai Ikan (shoumai with fish) (you can see the photo of shoumai at Es Teller in here , 5th from the top in “Food” section on the right side) – shoumai here is very different from the one I know. Very chewy, and eaten with peanut chili sauce and ketchup manis (sweet thick dark color sauce). After a while, everyone gathered up to this mall and had dinner together at a Chinese restaurant. 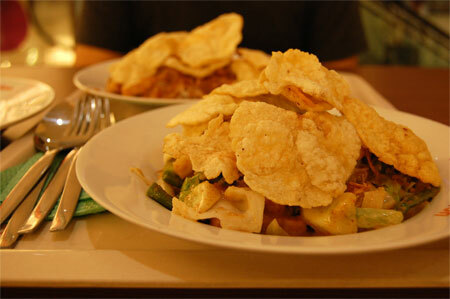 I really love food in Jakarta! Very cheap, so many kinds, and delicious!! I ate lots of Indonesian type of food during this trip, but I never get enough! That was my second visit to Jakarta. 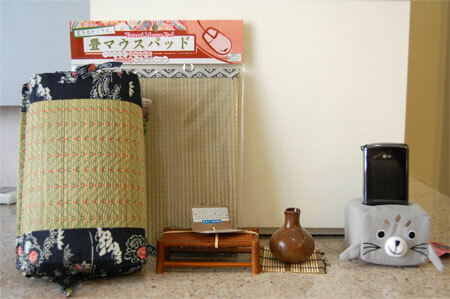 The first time was one year ago (2007): I stayed there in Christmas and New Year’s day. I have to admit that I experienced a huge culture shock in the country :p Indonesia (Jakarta) was quite different from what I was imagining in my head. There were actually lots of shopping malls, lots of restaurants (many cuisines: Japanese, Korean, American, Chinese, Indonesian etc) and more! And everything was inexpensive. Most of the famous franchises (like Krispy Kreme Doughnuts, Burger King, Starbucks, etc etc….) were there. I could even find Beard Papa\’s ! 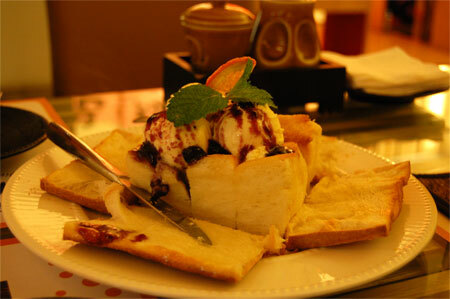 (cream puff franchise started from Osaka Japan) You could get almost anything in Jakarta. That was a surprise! 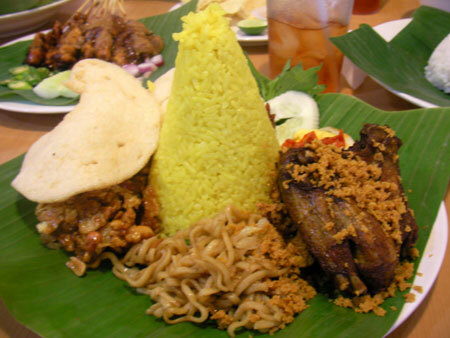 Since I was in Indonesia, I wanted to try original Indonesian food. Nasi Lemak? Gado Gado? (are they Indonesian?) Unfortunately, however, I was taken to Chinese restaurants most of the time. I’m actually sick of Chinese:( I eat it in Perth all the time! I wanted to try something exotic. So I asked them (in laws) to go to an Indonesian restaurant. 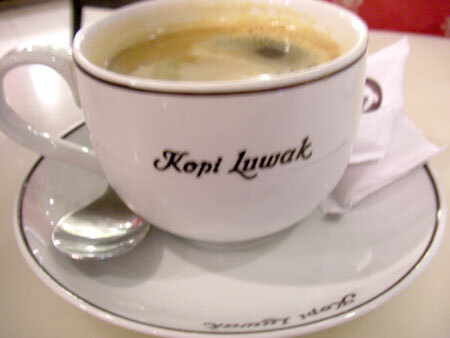 Then, they took me to this place called “Java Kitchen”. 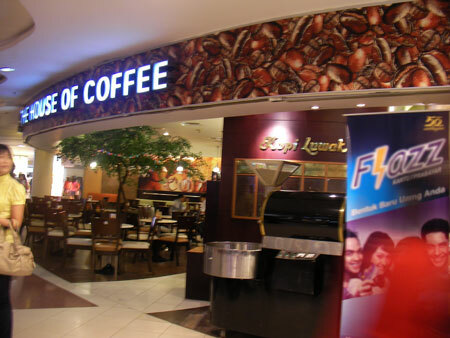 It’s a franchise restaurant and this place serves Java food. Nutty peanuts sauce Satay, Tahu Kacang, Sop Buntut (oxtail soup), mixed plates with a few dishes… I had a mixed plate of coconut rice, Ayam Goreng (deep-fried chicken), Kacang (peanuts), Sambal (chili), boiled egg etc. The sambal was really really spicy!! 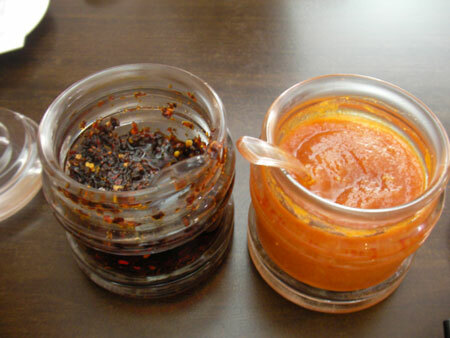 I love spicy food and usually eat sambal at home in Perth too, but chili sauce in Indonesia was much spicier. Do they use different type of chili or something? Anyway, even though I couldn’t finish those sambal, I enjoyed whole dish 🙂 Hot climate, hot food. I love the combination! My destination in Japan when I have no much money to spend, however, was either a family restaurant (Dennies, Big Boy, Coco’s..) or Mcdonalds. There are other fast food chain I go to sometimes, such as Mos Burger and Lotteria, but most of the time I go to Mcdonalds. The reason is that they are cheap, and I just like their concept. I don’t go to KFC even in Japan… I feel they are quite expensive:p And I prefer just eating delicious Karaage somewhere else rather than going to KFC. I was surprised when I saw Indonesian people eating KFC chicken with steamed rice the first time… It was shocking, actually. KFC is, for me, one of the fast food (=junk food) and I never thought anyone would eat fast food with steamed rice. Well, I’m used to it now and I sometimes eat those chicken with rice too :p With lots and lots of Indonesia chili sauce, of course. Is it only Indonesian people who eat KFC with steamed rice?? 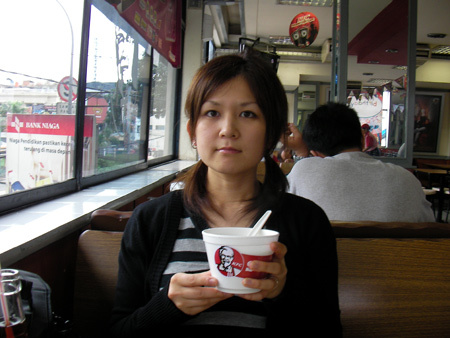 There are one more thing about KFC and Indonesia… When I visited Jakarta, my partner and I went to KFC. 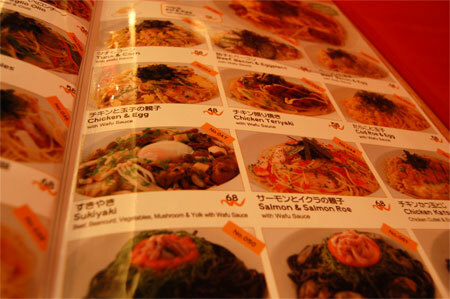 I was amazed by their menu; they had steamed rice, soup, and Bento Box on their menu board!! Yakiniku usually means grilled beef (sliced meat), but they just used KFC chicken!! 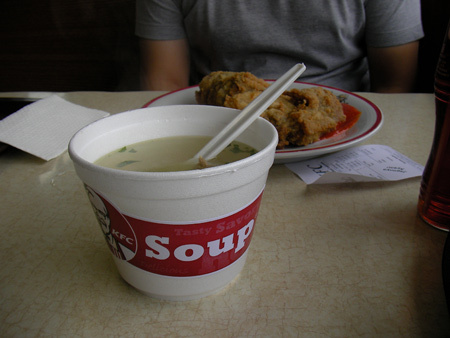 I tried the soup; it was ok … but few pieces of KFC chicken floating in the soup… ummm little weird to me:P Fried chicken in a soup! « Another Fan of Indonesian Fried Chicken? ?